CYRIL “THE SQUIRREL” UP TO HIS OLD TRICKS AGAIN- SIGNING AWAY SOUTH AFRICAN ASSETS TO HIS CHINESE PALS! Cyril Ramaphosa has signed a (secret) deal with the Chinese to build a new 4,600-megawatt coal power station in Limpopo. 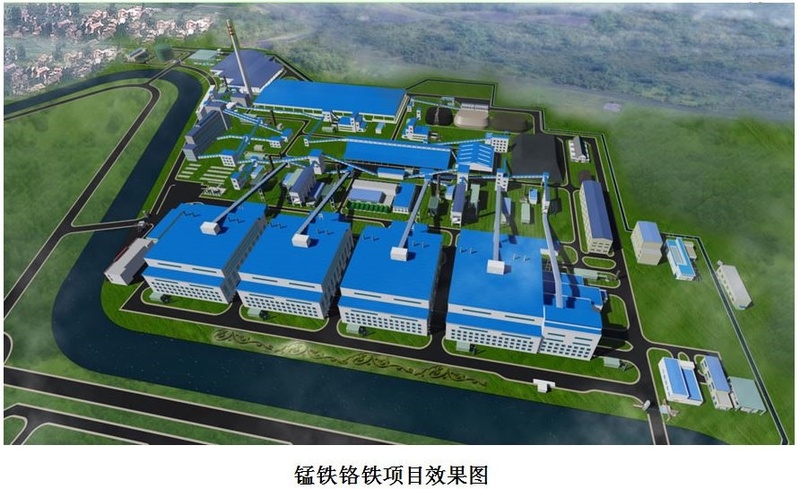 The power station will only serve a planned new Chinese-controlled industrial park, which will contain at least 7 metallurgical processing plants. A top energy expert says there is no rational reason to build the coal power station. THERE has been some confusion in the energy industry this past week after the announcement that a new coal-powered power plant is planned for Limpopo. According to reports, “The Squirrel” Ramaphosa inked a deal with the Chinese to build a new 4,600-megawatt coal power station during his visit to that country. Earlier this year, nine Chinese companies committed to invest $10 billion in the Musina-Makhado special economic zone at a signing ceremony in Beijing. 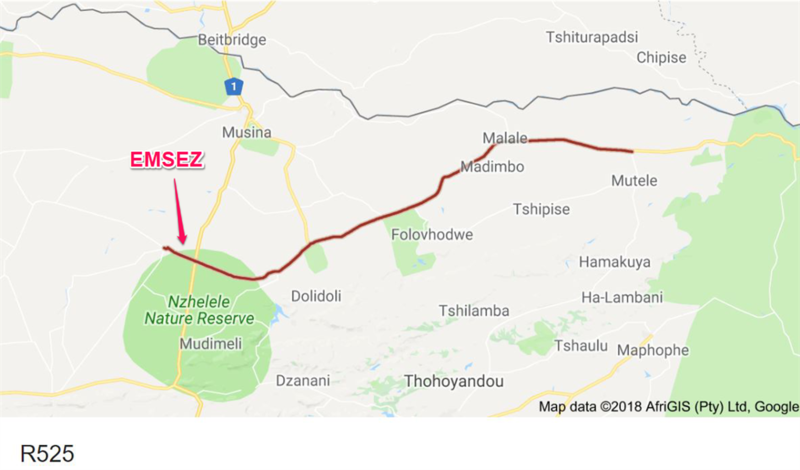 The companies are specifically investing in a large new planned ferroalloy industrial park, which will span 60 square kilometres on an area outside Musina. 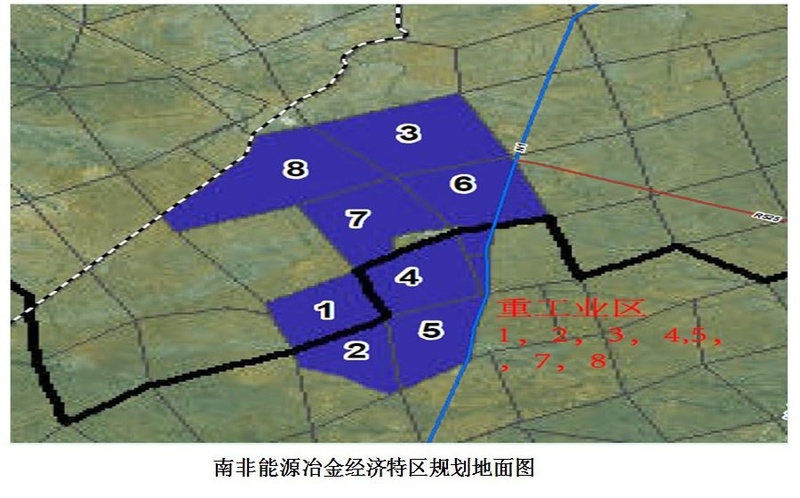 The location of the new Chinese industrial park, according to the EMSEZ website. 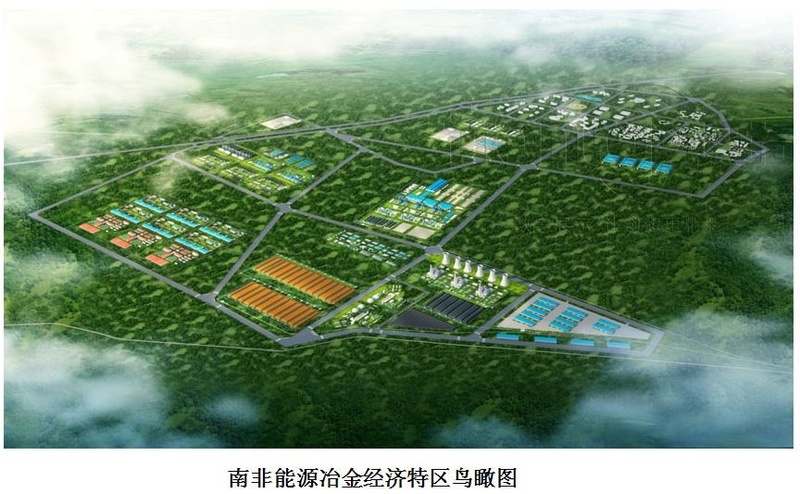 An apartment building, hotel, shopping mall, hospital and school will also be built. 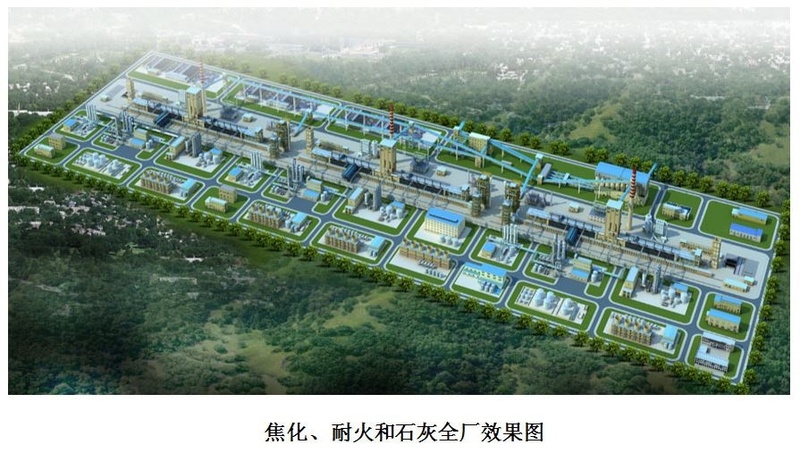 Included in the plans is the new coal-fired power plant, which according to the EMSEZ website, will be built “specifically for the project”. According to the information on the site, it does not look as if it will deliver electricity to the rest of South Africa. “I can see no rational basis for the power plant,” says dr. Grové Steyn, managing director of Meridian Economics and one of South Africa’s leading energy and infrastructure economists. Firstly, there is currently a surplus of electricity available on the network – the Chinese project wouldn’t have to generate its own power. (But South Africans get load shedding on a continuous basis? Who is bullsh*tting who now?- Ed) In addition, coal will be the more expensive option for the Chinese investors. Steyn says it is highly unlikely that a new coal power station will deliver cheaper energy than new renewable power projects on the national transmission grid, backed up by gas turbine generators. “A coal-powered power station will create fewer jobs than renewables and will obviously have massive implications for the health of local communities and the broader environment – which is unnecessary given that there are cheaper and cleaner alternatives.” Work on the power plant is supposed to start this year. According to the EMSEZ website, investors are attracted to the project because of the nearby coking coal reserves (estimated at 10 billion tonnes) as well as SA’s chromium reserves (83% of the global reserves) and manganese resources (81% of total global reserves). Water from the Limpopo River, 30km away, will be used in the project. The participating companies will get substantial tax breaks: apart from VAT and import duty relief, they will pay a reduced corporate tax rate of 15%, instead of 28% for SA companies. The Chinese Communist Party takes over national assets when the incompetent African native governments fail to repay their debts on schedule. Criticism will not deter the communists. Debts shall be paid! Zambia for instance is on the verge of becoming the first victim to the Chinese ambition of acquiring the property, infrastructure and natural resources by tightening the noose of huge debts. The Chinese decisions to acquire the Gwadar port in Pakistan and Hambantota port in Sri Lanka against huge loans came under severe criticism from the international community. China has already acquired the government news channel ‘ZNBC’ and is now making moves to acquire the government owned power company ZESCO and the Kenneth International Airport. Media has expressed concern that China will gain control over the Zambian economy and end the sovereignty of the country.Now the Squirrel again “secured” a huge loan from China to the extend of R33.4bn to ESKOM and a seperate loan of R 4 bn for Transnet. “There are no specific conditions for this loan. Eskom has indicated it will not be able to make the loan agreement public since it contains information that may put Eskom at a disadvantage when negotiating in the market.” said Ramaphosa. “The China Development Bank facility is more competitive than the global market rate. The loan is government guaranteed – under the existing Government Guarantee Framework Agreement”. Did you read correct? Yes…GOVERNMENT guaranteed– NOT ANC “guaranteed –iow the ANC are making dangerous deals and the dwindling tax payer will have to pay back the loan- and if the ANC is ousted in the 2019 elections- this becomes the innocent new government’s problem. What happens if Eskom defaults on its R33 billion loan? This is a question many are asking and which has led to the DA demanding answers from Eskom about the loan. Considering what has happened in other countries, this is a question worth serious consideration. In Sri Lanka, the government has handed over its deep-sea Hambantota port – as well as 15,000 acres of land – after battling to meet its repayments on the near R23 billion loan to build the port. The deal also goes toward helping the tiny country (65 610km²) repay its massive debt to financiers around the world. The New York Times claimed “the government is expected to generate $14.8 billion in revenue, but its scheduled debt repayments come to $12.3 billion”. “The case is one of the most vivid examples of China’s ambitious use of loans and aid to gain influence around the world – and of its willingness to play hardball to collect,” the Times wrote. The China Development Bank loan to Eskom came about at the 7th Forum on China Africa Co-operation held in Beijing this year and “serves as the official summit between the Chinese president and African heads of state, and results in major policy and financing announcements”, the China Africa Research Initiative at the Johns Hopkins University School of Advanced International Studies said on its website. According to the Washington Post, Beijing is paying more than lip service to African aspirations. “Often with support from Beijing, Chinese companies have been building special economic zones in Africa, creating platforms where Chinese and other firms can cluster together. “In 2015, at another Johannesburg summit, [President Jinping Xi promised $10 billion toward a China-Africa industrial capacity cooperation investment fund,” said the Post. In June, Quartz Africa reported China was strengthening its military presence in the continent. “At a time when the United States and European countries are adopting isolationist policies, Beijing is making power moves abroad, for example by opening up its first overseas military base in Djibouti,” Quartz wrote. Then it was discovered that China is not only stealing and occupying Philippine Territories at the West Philippine Sea or Spratly islands but at the same time, they also stealing massive quantities of soil from different parts of the Philippines for both mining and island-building purposes. Now this is the locusts Ramaphosa want to set loose on the hapless South Africans! Ramaphosa neatly side-stepped the responsibility and legal accountability part, dumping the liability on the tax payer and most probably a new government. Thus the Squirrel technically de facto blundered ahead and sold ESKOM and TRANSNET to the Chinese. Taking in consideration the ANC’s poor track record and that of their failing SOB’s- together with the financial mess they got the country into- they most probably will NEVER repay this loans. Ramaphosa and his greedy ANC “cockamanies” are fast on track to take South Africa precisely where the Zambian idiots took their country- a systematic “take-over” by the Chinese. The importing of 15000 Chinese rice farmers,a clear indication that the ANC does not care about developing their own black farmers as well.AND that is not the biggest threat yet. The Squirrel also allowed the Chinese army to get a foothold in South Africa as his cohorts signed an agreement where the Chinks could expand their military in South Africa. South Africans – wake up- Ramaphosa is busy handing your country and lives over into the hands of the Chinese. SO- Again we see the Squirrel busy selling SA’s minerals to his Chinese pals- and with that- HUGE pieces of land as well. This is now the same Squirrel that- for this past months- have been whining about “expropriation” of white owned land because he recons- poor “landless ” blacks have no-where to stay. Meanwhile Mr. Squirrel signs away the same land to foreign scavengers he “promised” to the “poor blacks” himself. What a sly con-artist this critter can be? Speaking with forked tongue now aren’t we Mr. Squirrel? Now one tend to ponder about all the millions of dollars in secret back-handers that surely will put a smile on every ANC fat cat’s dial! But Lo- let even ONE local South African even dare to open his/her own mining company and pull a stunt like this and boy- will that individual quickly and effectively be arrested and bulldozed out of business! Ramaphosa and his devious ilk again are busy allowing the rice insects to plunder South Africa’s resources at will – naturally to the self enrichment of the ANC rat pack’s own agendas- that is. Say no more!! This is a clear indication where the ANC is taking the country- Chinese control. To further add to the insult against homogeneous South Africans and a clear indication the ANC wants to flood the country with the new Chinese ” masters” – the local school curriculum is under review, and the ANC are adding Mandarin to the curriculum. “We need to learn Chinese to communicate better with Chinese farmers and engineers’” says Angie Motshekga – the rat pack Minister Of Education. So- all white South African farmers now gets pushed off their agricultural land to make way for Chinese rice pumpers? Commentary by CoM members – in university they do not even don’t place enough emphasis on teaching subjects in local dialects such as Ndebele, Northern Sotho, Sotho, SiSwati, Tsonga, Tswana, Venda, Xhosa and Zulu, YET THE RIDICULOUS ANC WANTS TO ADD MANDARIN ? And as always will we hear the lies about how this projects ( like so many others that slipped through the public scrutiny net) will “benefit” South Africans. “Jobs “, “investment” and “houses ” will be cooked together with the yellow deceptive carrot to mind bang the poor naive black population again into believing the Chinese really are “good fellas”- and will “take care ” of them while the rice insects devour their country right in front of their eyes . SO– our black inhabitants recon the Chinese are the “friendly” guys? Well- this Ugandan minister found out just HOW “friendly” the Chinese were when they lost out on a state tender.